This coil contains a relatively large internal/external core. Connections are simple - one prong for positive, and negative is simply connected to the core frame. Also, be sure to ground the core frame to the engine head as well (ground). It includes approx. 18" of spark plug wire. The coils are enclosed in a plastic cylinder and potted with epoxy. This makes them very rugged and oil/fuel proof. Approx. 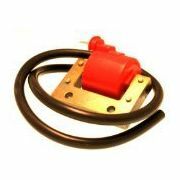 Size: 2.25" x 2" x 1.75"
IMPORTANT NOTE: If used with the BuzzCoil or PICTIM ignition (which switch the coil on the negative connection), do NOT ground your battery to the engine. This will short, overheat and destroy the coil! This is not necessary on the TIM6 as it is switched on the positive connection.